I have been highly productive on my day off, and even yesterday evening! I finished my husband’s pyjamas and now then fit him as he likes. It was funny to hear him be surprised at the number of times he has to try them on. He might be starting to understand the use of a dress form! I’ll be taking photographs and posting this weekend. That was finished yesterday, then I cut some white woven cotton to sew a muslin to check the fit of the Sewaholic Cambie dress. It means that I was ready this morning to sew my muslin. Can you tell I’ve been playing around with Google Photos options? Maybe I should have ironed the front fold..
I’m already happy with the fit, even if there are some things to be changed. Proper shoes instead of going bare feet, to have a better idea of the end result. When I traced the pattern, I added 3″ to the length of the skirt, because I was worried it was going to be too short. Apparently I shouldn’t have worried, because I ended pinning 2″ away. – I reduced the skirt from a size 16 to a size 14, it seems enough and I can still fit in. – I reduced 1/2″ (1.2 cm) on each side seam under the arms and tapered to nothing at the waist. – Both bodices were slightly too long: the waistband was sitting on my high hip bumps and it was not very pretty. Nor comfortable. So I shortened by 1 cm (3/8″) at the front and 2 cm (3/4″) at the back. – As the bodice and the skirt are not the same size (12 / 14), I changed the darts of the skirt: they are slightly widened. Then I transfered all modifications to the pattern paper and made sure I also changed the lining parts, even though I didn’t cut any for the muslin (phew). And finally I cut the real fabric, and started working on it. I can’t go any further because I’m supposed to start sewing the lining and I don’t have any so I need to go shopping tomorrow. I need to do something with the darts, because they’re ugly: I can see them too much. I wonder if you have an idea of what I can do? maybe lengthen the dart? The darts might be less obvious in your final fabric, depends on what it looks like. They really stand out in the white as the shadows are so strong. If you’re making the Cambie in black they won’t show as much. Looking forward to seeing your finished dress! The muslin looks good already. I have bought the pattern, but I’m going to put it aside for a while as I think it’s too advanced for me at the moment. For this pattern all the steps encountered are basic ones: darts, finishing seams, zipper. You’ve seen all these already! The part that I found harder was to sew the waistband with a consistent width, so that both ends of the waistband actually match on each side of the zipper. Aren’t non-sewers funny when fitting garments for them. Maybe that’s why my JJ said I should get a dress form…! 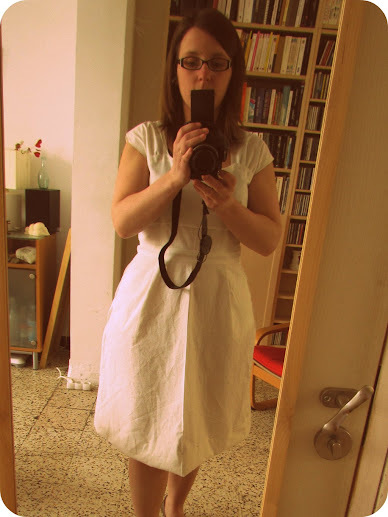 Yes I’m very happy to see how my muslin turned out, and also that time and effort did pay!